8′ Bahama Rectangular Extension Table Set is made of a plantation grown teak wood, which gives you irresistible looks and lasting durability. 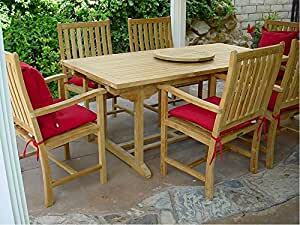 This set consist of 1 Bahama rectangular extension table and 8 Wilshire Dining Armchairs. Simply remove the umbrella brass plug to easily add shade. With this table, you will enjoy a comfortable, elegant outdoor setting for truly memorable gatherings. It comes with 1 rectangular ext. table and 8 dining armchairs. Cushions and lazy Susan are not included.